Now that I’ve passed 5 weeks and taken my bands out, and much of the swelling has gone down, I’d say from outside appearances I am looking mostly recovered to other people (not that I am going to take a poll on if I seem normal). But I feel far from healed. The doctor said yesterday I was not opening up wide enough. I was feeling semi-pleased with my progress before the check-up. At yesterday’s appointment I could open 18 mm. Before surgery I think I could open about 49mm, to give you a comparison. The doctor would like me to be opening past 30 mm by my next appointment in about two weeks. He gave me some exercises to do multiple times a day. Now not only am I practicing open and shut, but also side to side and forwards. I won’t deny it, these stretches are PAINFUL and leave my jaw sore afterwards. After doing them, I feel so flexible. Only to find the next time I do them it seems I am back where I was. I mainly have to wear the two bands overnight now, and a little during the day. That definitely making it easier to practice opening, and for talking as well. But the point of the bands is to keep training my jaw where it is supposed to stay. 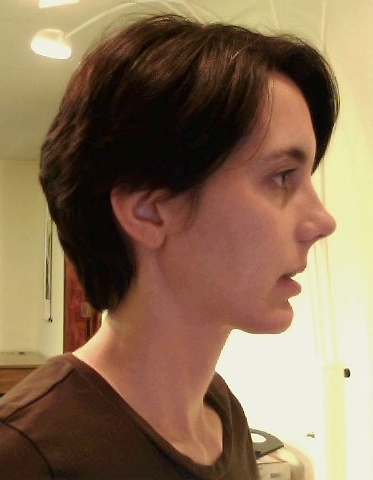 I am doing a lot better at keeping my jaw in place even without the bands. However it does not feel natural to me it. I have constant jaw strain from this; I think it will take a while before it feels normal. How does my face feel anyway? My face does not feel right yet by a long shot! If I pay attention, the lower jaw feels shrunken and pushed back, and my upper jaw feels huge and stiff. My teeth feel like they have an overbite, although to be honest I think they are fitting together perfectly. None of this feels natural or normal, and when I look in mirror, it does not look natural or normal yet either. Thought it’s not that obvious, I still have some swelling in the face, evidenced by the pressure when I use my facial muscles. And just maybe (haven’t scientifically determined this yet) the pressure increases greatly when we get cold fronts. Or I guess it could be doing this randomly. Who knows. Well, slowly. I can use a small fork (at home, privately) with plenty of napkins and plenty of time. I can also use baby spoons. I’m still drinking some of my meals; I just don’t have to thin them down anymore, which does make things easier. I can manage any food that’s small and is already ground up, or soft enough to squish around and swallow. Some types of things I can eat: scrambled eggs, baked fish, rice pasta, polenta, oatmeal, applesauce, sliced cheese. I don’t think I will attempt small grain things like rice & quinoa for a while; just too hard to clean afterwards. I’m just happy it’s much easier to clean my teeth! After de-splinting I quit using the prescription mouthwash; it’s back to regular now. I thought about continuing, but it says long term use can stain your teeth. I can floss most of my teeth with patience. (Flossing the back is painful since I can’t open far, and the wisdom teeth? impossible). The pressure is slowly decreasing. Less pressure when leaning over (not that I do it much). Less pressure when smiling. I’m slowly regaining energy. Still tired most of the time, but every week is better than the one before, and every week I can do a little more. Also I am dreaming dreams again. I notice I feel more rested when I have normal dreams (which granted for me are pretty weird). So I guess I’m sleeping better. Last week was my first full work week. I was pretty exhausted and a little overwhelmed. This week I managed a little better. Here’s a pic showing how much I can open. I tried to add some emotion to the pic but not sure of the result. And one normal one just so that’s not the only picture in this post. 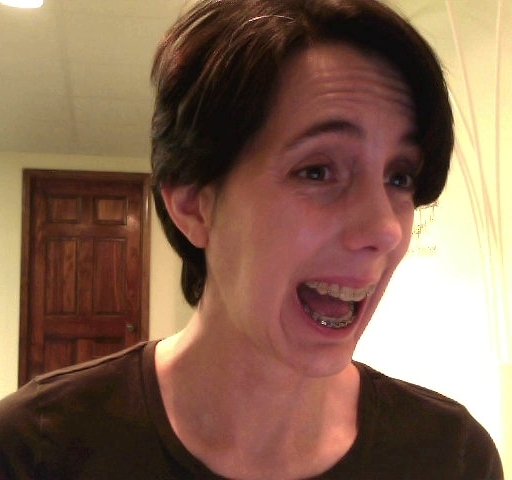 I just found your blog 🙂 I’m just getting started on the jaw surgery process, and it is awesome to see someone who is on the other side! Thanks.. it is nice to be on the other side! It’s been a long journey. Best wishes for your process ahead. I guess week 5 is still “early days”. Does it seem like this whole thing is going on for a really long time or is the time going quickly? Are you still sleeping in the recliner? How long after the surgery are you allowed to sleep flat? Nice photos – you look like you’re opening quite wide. Are you allowed to do any exercise – is that determined by length of time after the op or on how much energy you have? Apologies for all the questions. I’m consulting a surgeon the week after next and hope to start the process as soon as possible thereafter but feeling quite apprehensive about the whole thing. Your run downs are super helpful. Hey Deb, 5 weeks seems like forever to me! But I guess I am heading toward the home stretch. I was cleared to sleep flat 2 or 3 weeks ago, though at that point I didn’t because I still had some congestion. The last couple weeks I sleep in the recliner because it’s the best way I’ve found to keep my head where it needs to stay while I sleep, and lets me sleep a little sideways and still be okay. I still can’t sleep on my side (puts pressure on my not-yet-healed jaw) and sleeping in the bed I am so tempted, and my head tends to slide sideways as I sleep. I’m able sleep without worrying and waking up frequently to check where my head is. I haven’t really talked to the doctor yet about exercise. Early on he said it would be a while. I know I am not there yet. Even as I walk, I have to be careful not to walk heavy as the impact jars my face. So from that I know I’m not up to doing much. At maybe 3 weeks I started doing some light stretches and lifts, just to help keep my muscles active. Nothing that causes me to bend over or strain. Any straining also adds pressure to the face. Sadly, it’s been very cold here and cold also affects my face, so I try not to be outside much. I would otherwise be talking walks around outside. I do miss that. Thanks Lois. It will be interesting to see how long it takes for you to feel really normal again. I’ve been following the cold weather you’ve been having over there in the US. It must be hard. We’ve been having the opposite although not as bad here in Sydney as in our southern and South Western states where they’ve had horrendous protracted heat waves and bush fires. Good luck with the jaw exercises and hope the pain improves quickly.